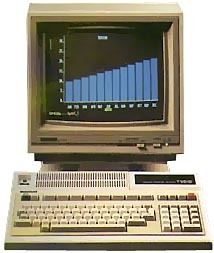 The T100 was the US version of the Japanese PASOPIA computer. It was intended to be a professional CP/M machine. It had a small built-in LCD screen (6 or 8 lines of 40 characters or 320 x 64 pixels in graphic mode). This LCD screen was an option (not built-in). It fitted into slots at the back of the keyboard/cpu unit. There were 2 CRTs available: 13" monochrome (green), and 15" color with a proprietary RGB interface. The twin floppy drive was a separate box. It was possible to plug a memory module into the slot under the flip-up cover at the rear right of the keyboard/CPU unit. That was the only way to add memory. see more Toshiba T 100 Ebay auctions !